The Future of the Construction Workforce - Pyramid Construction Services, Inc.
On a chilly day in December, over 50 students in the Construction and Maintenance program at Cumberland Perry Area Vocational Technical School got a look at an active work site for the future home of the West Shore Bureau of Fire. 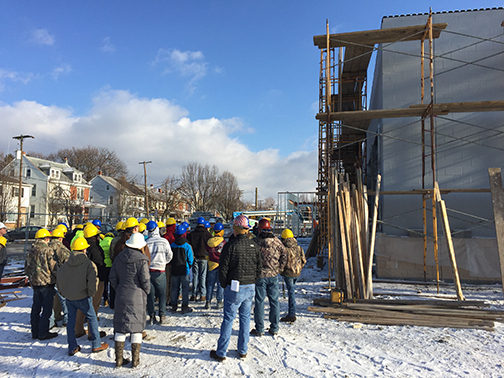 Two groups of first year students interested in carpentry, masonry and welding traveled to the site where the West Shore Bureau of Fire’s new home is currently being built by Pyramid Construction. 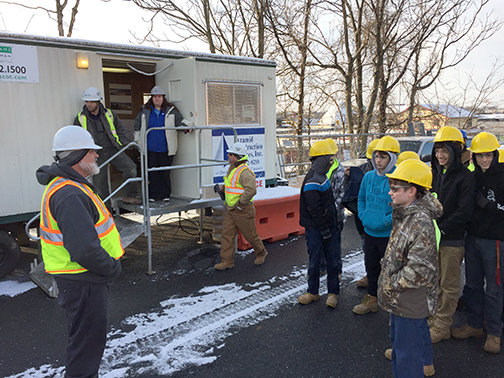 Upon arrival and after being outfitted with the proper safety gear including hardhats and protective eye wear, the students gathered outside the trailer that serves as an office for Pyramid’s project superintendent. 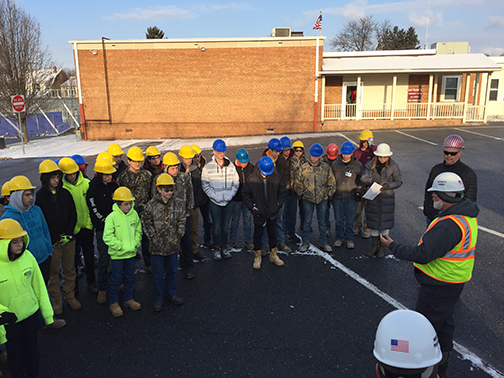 (pictured above) Project Manager for the West Shore Fire job, Dan Gibson, speaks to students and describes the many aspects of planning and completing a job like the one they are visiting. From pre-construction to final turnover Gibson explained the various positions and skills needed for it all to be a success. Pyramid’s Safety Director Mike Zellers spoke about the importance of safety in the construction industry. Zellers went on to describe some of the types of safety protocols that they would be see on the job site including the fall protection system. 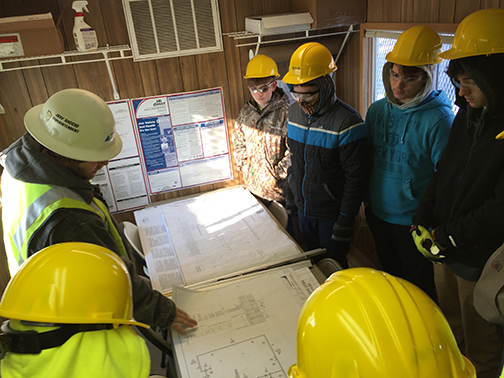 In the afternoon, Owner’s Representative, Dennis McGee recounted for the students the process of selecting a construction company once they were ready to move forward with the project. From 10 companies, Pyramid was picked because of the strong local ties the company has, McGee explained. The group then moved on to the work site, where several different types of activities were observed, including welding of metal roof joists and erecting of structural wall studs. 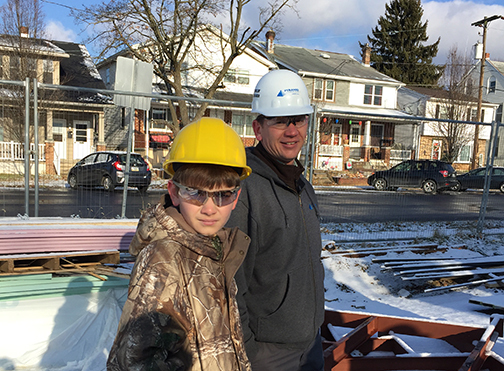 This field experience in the construction industry is one way of cultivating the next generation of workers. Currently, the construction industry is challenged to find skilled labor. Pyramid is dedicated to generating interest in students who will become the carpenters, welders and masons of tomorrow. Pyramid Project Manager Mike Deimler joined son Mike on the tour of the site. The passing on of vocational tradition is strong within construction and is one way the industry is hoping to keep skilled trades vibrant in the future.